Brig. Gen. Dana A. Hessheimer is the Director, Joint Staff, California Military Department, Sacramento, California. The Joint Staff is comprised of more than 120 personnel including Army, Air Force and civilian employees in varying duty statuses located at geographically separated facilities throughout Northern California. The Joint Staff provides staff support, enabling the Adjutant General to Command the State Military Forces and Direct the California Military Department in organizing, resourcing, and training Joint Forces with unique Capabilities serving the Community, State, and Nation. General Hessheimer began his military career in 1988, receiving his commission from the University of Nebraska-Lincoln Reserve Officer Training Corps before attending undergraduate pilot training at Reese AFB, Texas. After graduating from pilot training he was assigned to the 55 WG at Offutt AFB, Neb. and flew the RC-135. His first deployment was flying combat missions in support of Operation DESERT STORM. After separating from the Active Duty in 1994, General Hessheimer joined the Nebraska Air National Guard and flew the KC-135. He was a Traditional guardsman for two years then was hired on full-time as an Active Guard Reservist. In 2000, he joined the CANG as the Chief of Safety. He continued flying the KC-135 until the unit converted to the Predator mission. He also was the Liaison Officer in Istres, France three times during his time in both Nebraska and California. General Hessheimer is a command pilot with more than 4,000 flying hours in various aircraft, including the MQ-1 Predator Remotely Piloted Aircraft, KC-135, RC-135 (Rivet Joint, Combat Sent, Cobra Ball and Cobra Eye) and T-38. He was Acting Operations Group Commander when the unit deployed in support of Operation IRAQI FREEDOM. He has also acted as Detachment Commander on three separate occasions and was the Director of Operations in both the, 196th Reconnaissance Squadron and 163d Operation Support Squadron. General Hessheimer deployed to Incirlik, Turkey as the Expeditionary Operations Group Commander for the 39 Expeditionary Operations Group in support of the MQ-1 NOMAD SHADOW mission which is a Presidential directed mission to support our Turkish allies. His deployments include: Operation DESERT STORM, Operation DESERT CALM, Operation SOUTHERNWATCH, Operation DELIBERATE GUARD, Operation JOINT GUARD, Operation JOINT FORGE, Operation NORTHERNWATCH, Operation IRAQI FREEDOM, Operation ENDURING FREEDOM and Operation NEW DAWN. 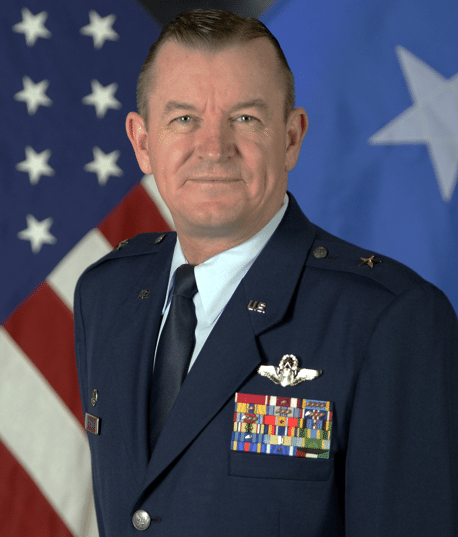 Prior to his current position, he served as the Wing Commander, 163d Attack Wing, March Air Reserve Base, California. 1988 Bachelor of Science degree in business administration, University of Nebraska, Lincoln Neb. 2015 Master’s degree in management leadership, Liberty University, Lynchburg, Va.
January 1994 – December 1995, Co-Pilot, 173d Air Refueling Squadron, Lincoln Air National Guard Base, Neb. October 2017 – Present, Director, Joint Staff, California Military Department, Sacramento, Calif.